Happy New Year Readers! We hope you're feeling inspired, creative and ready for 2019. 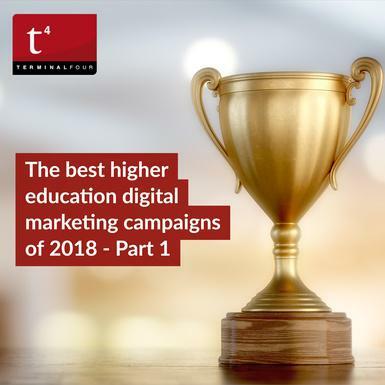 Each New Year, we always like to take a pause and look back on what stood out to us as digital marketing highlights in the higher education sector the previous year. We then force ourselves to pick just ten of our favorite campaigns which always proves a challenge! Every time we do this, we're always blown away by just how good you guys are! So pat yourselves on the back and enjoy a trip down memory lane. The University of Oregon "Throw your O" campaign invites students, alumni, faculty, staff, and fans of the university everywhere—to share how they have found their passions and made their mark on the world or in other words how they "throw their O" in pursuit of excellence. The is a multi channel campaign with strong engagement across lots of channels including Twitter - take a look at the #ThrowYourO hashtag on twritter. This gorgeous video was released in December last year as a Season's Greetings from Oxford University and as a way to promote Oxford's rich history. The University has seen a lot of Christmases and New Years', and been witness to some incredible moments in history! This video explores this rich history through letters between two old friends. Back in January 2018 last year, we penned a blog about our love for Georgetown University's series of Instagram videos where they recreated popular TV shows with the help of their furry mascot, Jack. We have been firm fans ever since. Jack the bulldog pops up regularly on their social feeds and is always a big draw for followers! We especially loved their Halloween campaign; a retelling of The Haunting of Hill House. 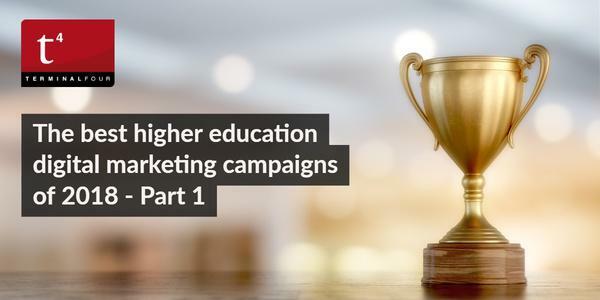 In April of 2018, Goldsmiths University launched a stunning recruitment campaign to show the diverse range of subjects on offer at the university. The recruitment campaign was rolled out across print materials, university prospectuses, student magazines and merchandise as well as online across Goldsmiths' website and social media. One of the key components of the campaign was the striking "One Goldsmiths" video. The Colorado State University "Proud to be" campaign is brilliant for so many reasons. But, have you watched the video? Days after watching it last year, I still had the catchy song stuck in my head! If you haven't seen it, watch it now, it's a triumph! So, that brings us to the end of Part 1 of our countdown. Part 2 of the series is now available here.